The 44 m footbridge opened at the end of 2010 and is now used by approximately 1500 people a day. The 44 m long, 3.5 m wide carbon composite pedestrian bridge was to be built over the Manzaneres River and therefore needed to be made as a single structure. The challenge lay in designing a load bearing, single piece structure that was also lightweight so as to meet the transportation, logistics and installation requirements defined for the project. As the installation site was in the city centre, space limitations and the need to limit disruption meant the constructors were allowed a maximum of 4 hours to install the bridge onsite. It was therefore imperative that the bridge weighed as little as possible. To achieve a weight which would assist ACCIONA with meeting the installation timescales while realising high levels of endurance and performance in constructing the single bridge beam, the engineers used a range of Araldite® products from Huntsman Advanced Materials. Araldite LY 1564 epoxy resin / Aradur® 3486 hardener, a system designed for manufacturing thick composite laminates, was tested in preliminary infusion trials and then used in the production of the single bridge beam using an infusion process. The long pot life of the epoxy system (520-620 minutes at 23°C) proved particularly beneficial in producing the large sections of the beam in a time-effective manner. Araldite LY 3505 epoxy resin / hardeners XB 3403 and XB 3404-1, a system designed for the production of high performance composite parts and moulds using the wet lay-up process was used to fill and reinforce the prefabricated ribs of the bridge. The ribs were bonded to the beam with Araldite AW 4856 / HW 4856, an epoxy adhesive system with enhanced toughness, chemical thixotropy and low exotherm for large composite parts. Its physical properties allow usage in applications requiring load bearing strength and excellent adhesion under adverse application conditions. The adhesive system also offers heat and chemical resistance. “We needed a thick laminates manufacturing system offering good fluidity and permeability and a bonding solution with extremely reliable adhesion,” explains Anurag Bansal, Head-Manufacturing, Infrastructures Area, ACCIONA R&D Centre. From the initial fibre placement through to the demoulding and finishing processes it took a total 30 days to manufacture the bridge. 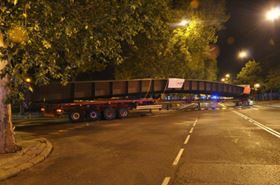 The 44 m long, 3.5 m wide, structural load bearing bridge beam was built utilising 12 tonnes of carbon fibre. The surface of the bridge beam is reported to be smoother and more aesthetically pleasing than a steel or concrete bridge, and it offers excellent corrosion resistance, less maintenance and no painting is required. Huntsman Advanced Materials says that if the bridge had been made from concrete or steel, the beam would weigh at least 50 tonnes, whereas the carbon composite beam is only 25 tonnes. The composite bridge was installed in less than 2 hours using a 75 tonne crane. Steel and concrete bridges typically take a minimum of 6 hours to install, using a 300 tonne crane. Thus the significant weight saving created by the single composite beam allows smaller cranes to be used, providing an easier, faster and more economic installation process. Because no joints, assembly or high capability cranes are needed for either installation or maintenance, the composite bridge reduces onsite plant requirements and opens up installation opportunities in a host of different locations. The footbridge opened at the end of 2010 and is now used by approximately 1500 people a day. ACCIONA is currently constructing a 200 m long single beam bridge in Cuenca, Spain. The company also plans to further explore the use of composites in construction applications across Europe, with a longer term view to undertake similar projects on a global scale.